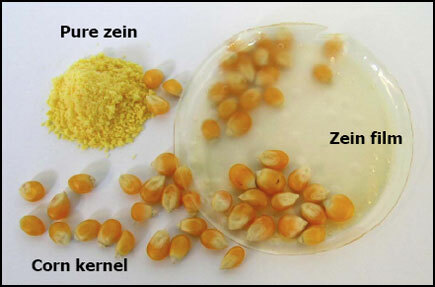 Zein is the storage protein in corn kernels. It has a number of unique characteristics and functionalities which makes zein very valuable in diverse commercial applications. Inherently resistant to water and grease penetration . Thermoplastic, which means biodegradable plastics can be made from zein. Non-allergenic, which permits its use in food products. Classified as "GRAS", (Generally Recognized As Safe) by the F.D.A. As a company, our first objective was to demonstrate the commercial potential for zein-based products in a number of applications. We have done that and currently sell highly successful products throughout North America. © 2018 Global Protein Products, Inc.